As Aaron Goldfarb and his wife welcome daughter Ellie to the world, he wonders what happened to the tradition of the proud new father lighting up a stogie. The Big Bird-yellow plastic tube held a cigar as brittle as a pile of autumn leaves. It’s not a particularly well-regarded smoke these days. It is, however, the cigar my father passed out on the fateful day back in February of 1979 when I was born. 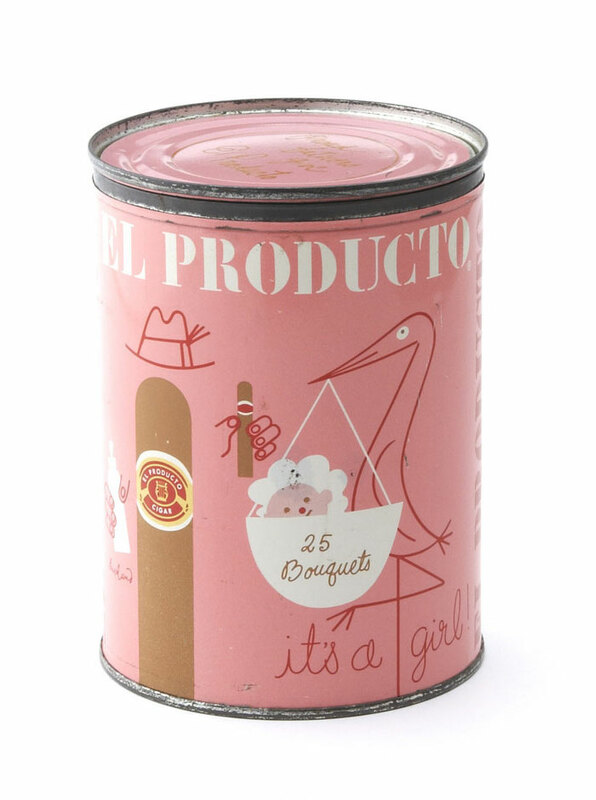 It’s a familiar tradition, of course: A child enters the world and the new father runs around the waiting room slinging “It’s a boy!” cigars to every man; he returns to work the next day with a box of “It’s a girl!” stogies to share amongst co-workers. 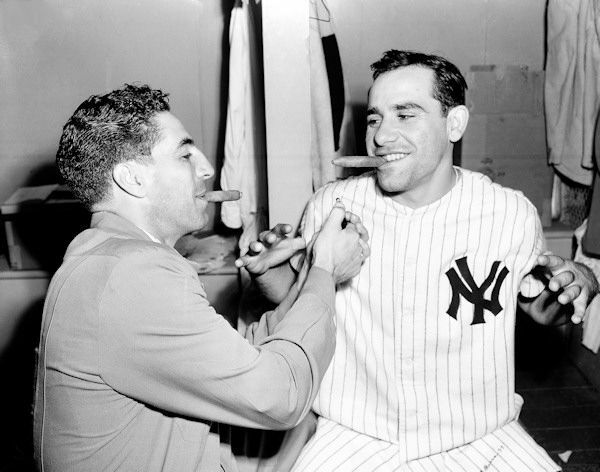 Here’s Yogi Berra sharing cigars in the Yankees locker room after the birth of his son. 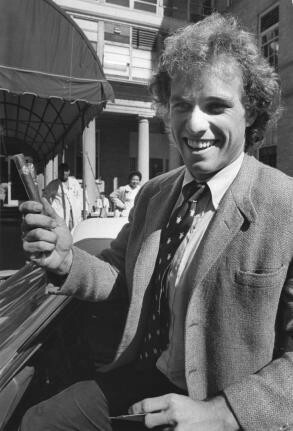 Or, proud papa Joseph Kennedy handing out smokes after his twins’ arrival. Yet, my daughter was born just two weeks ago, and if I’d started passing out cigars at the hospital, I feel like I would have been promptly removed from the premises. “This is principally due to the efforts by some groups and governments to reduce occasions and locations where adults can enjoy a cigar,” says Jim Young, president of Davidoff of Geneva North America, one of the country’s most high-end cigar makers. But is that still true in this era when less and less people are even smoking? As an occasional cigar smoker, I certainly wanted to hand out something—but something unique. So I hit up Custom Tobacco and, for about $10 per stick, I soon had a box headed my way. My wife didn’t understand why I wanted to do this, but maybe she’s not the traditionalist I am. This particular tradition apparently began with the indigenous peoples of North America, who would mark occasions, like a birth, with a feast of gift-giving. The ceremony was called the “potlatch” (pidgin language for “to give away”), and so often that gift was a primitive version of a cigar. By the 17th and 18th century, the tradition had spread to American households, where expectant fathers had nothing else to do but pace in the parlor, smoking, waiting for a new bundle to arrive in the other room. But, even as births moved to the hospital in the 20th century, men were still excluded from the process—barred from the birthing room no less—so what else to do but pass the time smoking with their buddies? 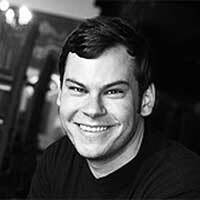 In Richard K. Reed’s 2005 book Birthing Fathers: The Transformation of Men in American Rites of Birth, he writes of “men-in-waiting” who were expected to self-medicate themselves with alcohol and tobacco while their wives struggled in the labor room. It goes without saying that a cigar has long been a phallic symbol; what better to puff on to let the world know that impending fatherhood hadn’t emasculated you? By the mid-20th century, many cigar companies were capitalizing on the tradition by producing their own gimmicky announcement sticks. General Cigar’s White Owl label started releasing “It’s a boy!” cigars around 1953. Roi-Tan would soon follow suit. There were ones from Dutch Masters and Phillies. Here are some Paul Rand-designed Robt Burns and El Producto “It’s a boy!” and “It’s a girl!” cigar ads from the 1960s--though many new dads of the time thought cigarettes more appropriate for a daughter’s birth. Unfortunately, though, these cigar were usually mass-produced, dimestore smokes—something that could be quickly grabbed in the hospital gift shop. “The truth is, we suspect many ‘It’s a [insert gender here]’ cigars went unlit, unsmoked and eventually ended up in the trash,” notes the BestCigarPrices blog. Thankfully, nowadays, men are not just allowed but encouraged to be in the birthing room—and perhaps that’s what put an end to the cigar tradition. I scrubbed up and sat by wife’s side in the sterile and, yes, smoke-free environment. And, sure, I would have loved to have been the cool guy instantly tossing Cohibas to my comrades, but post-birth I had to immediately make sure our healthcare forms were in order so that we could quickly get placement in a recovery room. Spending a good hour smoking a fine cigar with my buddies would have been a comical diversion. For me, the tradition would have to wait a few days. Unfortunately, today that fanfare has come to mean a well-timed Facebook post, maybe a bris with bagels, and perhaps, ugh, a bubblegum cigar, a sad “symbolic gesture” my dad admits he was passing out by the time my sister was born in 1982. Thankfully, certain manly rituals are starting to return. Janelle Rosenfeld calls passing out cigars a “tried and true tradition,” which isn’t just for fathers any more. As VP of marketing for Altadis U.S.A.—the premium cigar manufacturer behind such brands as Montecristo and Romeo y Julieta—she doled out cigars after giving birth to her baby boy. She suggests the iconic Montecristo Classic # 2 as most fit for the task, telling me many tobacconists have been reporting to her that customers have again started coming into stores looking for the perfect cigar to pass out when their wives are close to giving birth. 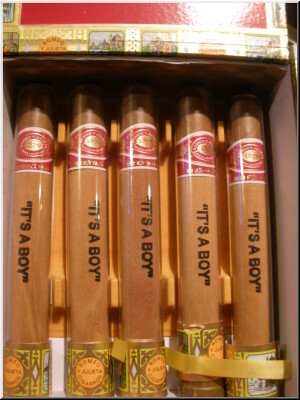 Luckily, today’s birth-labeled cigars aren’t just chintzy novelties. 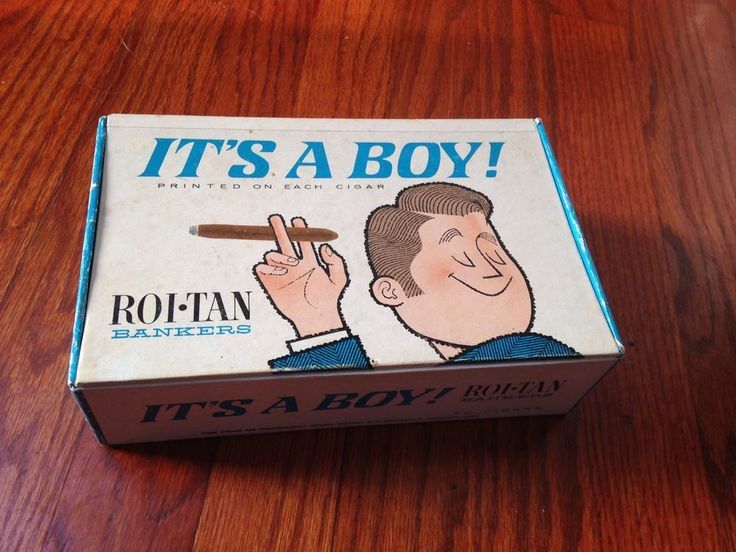 Many well-respected companies like Rocky Patel and Romeo y Julieta produce pre-branded “It’s a boy/girl!” cigars, much classier than ones from the past. “There are few occasions more special than the birth of a child, and when it comes to parents buying cigars to commemorate the birth of their son or daughter we haven't observed a change in direction,” says Rachel Mendler, president of Custom Tobacco, an online company that allows you to design personalized cigars for private parties, corporate events, bachelor parties, weddings, and, yes, new births.